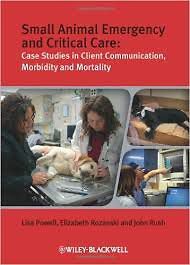 Small Animal Emergency and Critical Care: Case Studies in Client Communication, Morbidity and Mortality provides a unique opportunity to learn from real case examples. Presented as a collection of short case studies, a wide range of situations likely to arise in emergency practice is examined. The approach is modeled on the Morbidity and Mortality Conferences which were first established as a training and educational tool for medical doctors. They have now been successfully adopted in veterinary medicine as a forum for case review and learning opportunities, encouraging thorough review from different perspectives. Each chapter presents a real case, and highlights the pitfalls that both novice and experienced veterinarians can encounter. A key theme of the book is on communication issues. Owner perspectives are discussed, and how communications between clinicians and owners can be optimized to allow veterinarians to better meet owner expectations. The cases were provided by a variety of experienced veterinarians, primarily specialists in veterinary emergency and critical care, as well as other specialties, general practice, universities, and private institutions. Highly readable, this book is suitable either to absorb from cover to cover, or for reference to a specific case or situation. It highlights a number of common clinical problems and communication issues that either did or may lead to difficulties in case management, helping you to avoid these situations.